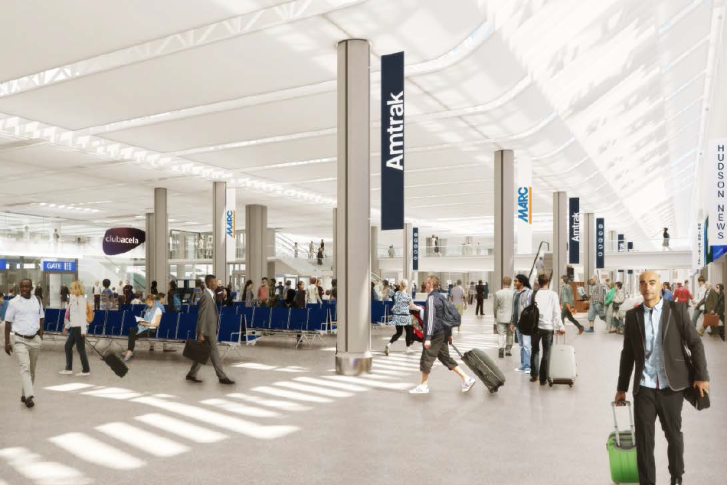 Union Station's intercity and commuter rail concourse will get an additional 20,000 square feet of new passenger space, nearly doubling the concourse's current capacity as part of Amtrak's investment in its Acela train service. WASHINGTON — Amtrak will use part of its $2.45 billion investment in faster Acela service to complete extensive renovations at Union Station’s often crowded and sometimes chaotic passenger concourse. Union Station’s intercity and commuter rail concourse is getting an additional 20,000 square feet of new passenger space, nearly doubling the concourse’s current capacity. Design for the project, announced in March, is already underway to upgrade restrooms, boarding gates, seating and a Club Acela Lounge. It also will include new architectural features and some natural light elements. The concourse project is a partnership between the Union Station Redevelopment Corporation, the Federal Railroad Administration and real estate developer Akridge, though funding for the project will come predominantly from Amtrak. The Concourse Modernization project is separate from the long-term station expansion that is currently ongoing, with a long-term goal of tripling passenger capacity and doubling train capacity over the next 20 years. For the new Acela service, Amtrak has contracted with Alstom to produce 28 next-generation high-speed trainsets capable of traveling at 160 miles per hour, compared to the current Acela top speed of 135 miles per hour. Amtrak plans to increase Acela service between Washington and New York to twice an hour. The first prototype of the new trainsets will be ready in 2019, with the first entering revenue service in 2021. All 28 new Acela trainsets are expected to be in service by the end of 2022.